Next up is BLACK JACK chewing gum. It has a VERY interesting history, in 1869 former Mexican President General Antonio Lopez de Santa Anna had been exiled & living in New Jersey. He had brought a ton of Mexican chicle with him in hopes of selling it to fund his return to power in Mexico. He persuaded Thomas Adams to buy it. Adams first attempted to create a rubber substitute but it failed, so he noticed that Santa Anna chewed it, so he made a gum with it and took it to a local store to see if people would be interested in it & well the rest is history. 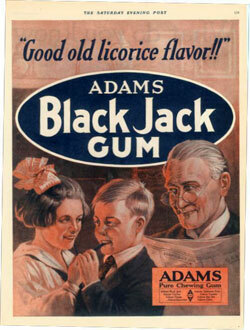 In 1884, Adams added licorice flavoring and called it Black Jack. It was the FIRST flavored gum in the US and also the FIRST gum to be offered in sticks. You can STILL find it today, as Cadbury Adams still occasionally makes it. MY MEMORY: I remember my mother getting ever so excited in 1985 or so, when the gum made it's "second coming", I tried it and was NOT impressed, because I was NEVER fond of licorice flavor. But whenever I see it, I remember that it is something that my parents used when they were growing up.